Allergies are hypersensitive immune responses to substances that either enter or come in contact with the body, such as pet dander, pollen or bee venom. 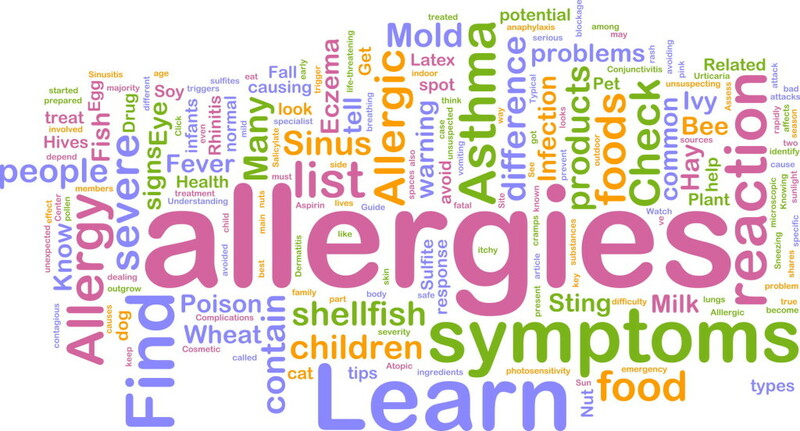 A substance that causes an allergic reaction is called an "allergen". Allergens can be found in food, drinks or the environment. Most allergens are harmless, i.e. the majority of people are not affected by them. If you are allergic to a substance, such as pollen, your immune system reacts to it as if it were a pathogen (a foreign harmful substance), and tries to destroy it. Allergies, including allergic rhinitis, affect an estimated 40 million to 50 million people in the United States. Some allergies may interfere with day-to-day activities or lessen the quality of life. Food Allery: Estimated to affect 4 to 6 percent of children and 4 percent of adults. Skin Allergy: Learn about allergic skin reactions and what causes them. Dust Allergy: People who have dust allergies are familiar with sneezing—but sneezing isn’t the only uncomfortable symptom. Insect Sting Allergy: Stings from five insects - honeybees, hornets, wasps, yellow jackets and fire ants - are known to cause allergic reactions to the venom injected into the skin. Pet Allergies: Pet allergies can contribute to constant allergy symptoms, such as causing your eyes to water, or causing you to start sneezing. Eye Allergy: Learn about eye allergies, a condition that affects millions of Americans. Drug Allergies: If you develop a rash, hives or difficulty breathing after taking certain medications, you may have a drug allergy. Allergic Rhinitis: If you sneeze a lot, if your nose is often runny or stuffy, or if your eyes, mouth or skin often feels itchy, you may have allergic rhinitis. Latex Allergy: Allergic reactions to latex may be serious and can very rarely be fatal. If you have the latex allergy you should limit or avoid future exposure to latex products. Mold Allergy: Molds live everywhere—on logs and on fallen leaves, and in moist places like bathrooms and kitchens. Sinus Information: Sinus disease is a major health problem. It afflicts 31 million people in the United States. Cockroach Allergy: Some people develop allergy symptoms when they are around cockroaches. Allergy symptoms occur when your immune system overreacts to something that is harmless to most people but triggers a reaction in anyone sensitive to it. This substance is known as an allergen. Allergies can be seasonal (worsening during certain times of the year, such as pollen allergies in the spring) or perennial (occurring year-round). Common allergens include weed or grass pollen, dust mites, animal dander, mold, insect stings and a variety of food types, such as eggs, shellfish, nuts, and grains. If you come in contact with something to which you are allergic, your immune system considers it dangerous and releases a chemical called histamine to counteract it. The release of histamine can cause a variety of symptoms, including a skin rash, headache, sneezing, runny nose, swelling, nausea, and diarrhea. The most severe reaction, known as anaphylaxis, can be life-threatening. If the allergen is something you breathe in, your reaction will most likely affect your eyes, nose, and lungs. 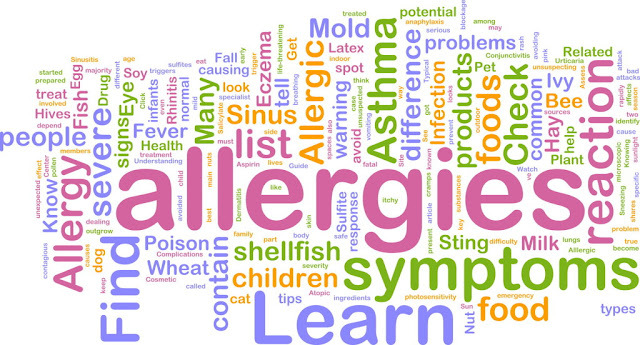 If the allergen is something you consume, you’re more likely to have symptoms in your mouth, stomach, and intestines. An appointment with a board-certified allergist can help determine the severity and cause of the problem. The allergist will discuss your medical history and symptoms and may use blood or skin tests to find out whether you have an allergy and what the allergen is. Medications (over-the-counter and prescription) and immunotherapy (allergy shots) may provide relief; making changes to your environment can also be helpful.